WARNING This Advanced Anabolic Muscle Building Protocol is NOT FOR BEGINNERS. It was SPECIFICALLY designed for ADVANCED lifters and HARD GAINERS who are suffering from Anabolic Slow Down (You can't build any more muscle). "Oh, and I can make you significantly stronger in just 3 short days! Interested? Keep reading..."
Look, I'm not here to waste your time... I'm not going to promise that you’re going to gain 50 pounds of muscle on this workout. What I WILL promise you is a workout routine that is unlike anything you've ever tried before - and I'll promise you it is an ADVANCED routine. In fact, consider this your warning - This workout is HARD. Hi, I'm Brad Pilon, author of Eat Stop Eat and creator of the Anabolic Again Muscle Building Protocol. As an author and Nutrition Expert I have spoken at some of the World's most prestigious scientific conferences, been interviewed by various newspapers, magazines and radio shows and am considered a well-respected expert in the field of nutrition. Because I want to make sure you know that I am legit. Quite frankly, there is NO WAY I would EVER put my professional reputation on the line by standing behind a boring cookie-cutter workout. I solve problems. That's what I do. And sometimes I come up with some very unique solutions to very complex problems. And that's exactly what I did with the Anabolic Again Muscle Building Protocol. Let me take you back to November of this year. I was an invited speaker at a National Exercise Physiology Conference and had just arrived in Vancouver Canada (Just in time for the Winter Olympics). After a long flight I had arrived at my hotel and was about to check-in when I met an old friend and mentor. "Brad is that you?" I heard from across the lobby. "Wow! You look exactly the same, just as lean as I remember you"
Yep... I died a little on the inside. Sure, to 99% of people this would be a compliment. But to me, ‘looking the same’ was a horrible accusation. He may have said ‘you look exactly the same’ but what I heard was you look no bigger than the last time I saw you, over 6 years ago! Normally, I wouldn't stress so much over this, but my friend is the Dean of Physical Education and Health at one of the world’s most prestigious Universities. So he knows Muscle and he knows Body Composition. I've been working out 4 days a week, every week for the last 6 years. And I looked EXACTLY THE SAME. Sure I was lean, and I'm pretty dang strong... But I WASN’T ANY BIGGER And it was true. My MUSCLE MASS had not changed in almost 6 years. Why am I in the gym trying to build muscle and NOT GETTING ANYWHERE? Needless to say, this stuck with me. In fact, it was still stuck in my mind, long after my lecture was over. I needed to get to the bottom of this. I decided it was time to do some research, and to be honest I was expecting MONTHS of research, but It didn't take long to realize what was going on. There was evidence. And, lots of it. Never heard of it? Don't worry because neither had I (I'm still surprised that NOBODY is talking about this issue). You see, once you get to a certain point (typically after gaining anywhere from 5 to 10 pounds of muscle), your muscles actually FIGHT to stay the same size. 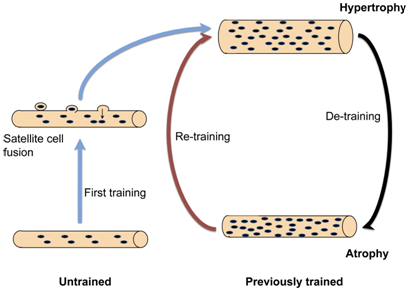 This is based on the principles of Homeostasis - after a while the same old stimulus (your typical workout schedule) just isn't strong enough to cause your muscles to grow anymore. We all know that you can't just keep building more and more muscle, but I never really stopped to think about the reasons. But the reason is SIMPLE. After you build a little bit of muscle, your body actually FIGHTS against building more muscle… In fact, you literally have to FORCE your body to build even an ounce of extra muscle. This is exactly what Anabolic Slow Down is – Your body fighting against you building more muscle. But then after a while, it all goes away. To you body, you have ENOUGH muscle... It doesn’t care that you don’t look like THE ROCK… it thinks you have enough muscle. 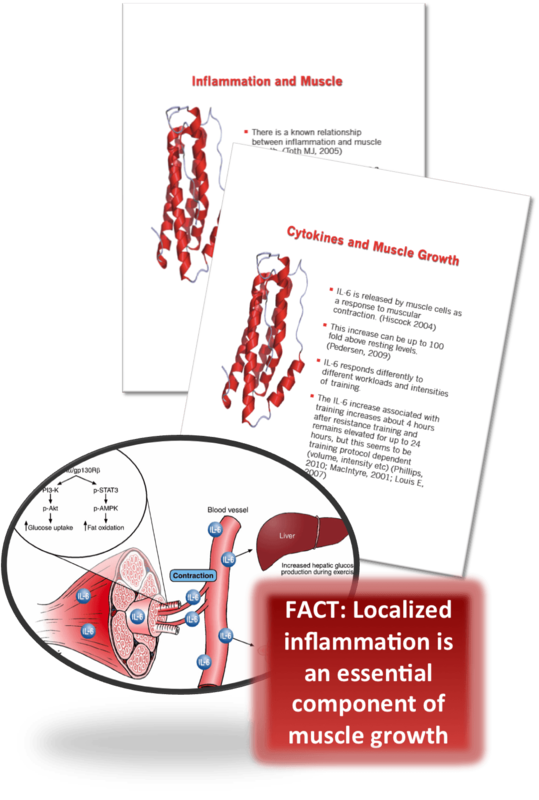 After all, muscle is energetically costly – Why would your body EVER let you build more than you need?? If you are going to fight Anabolic Resistance and FORCE your body to build more muscle… you are going to have to do something different… MUCH different. I’m not talking about some fancy new rep scheme - I had tried every workout under the sun from powerlifting to bodybuilding to athletic style training, if there is a set and rep combination that worked I would have already come across it. And I’m also not talking about some secret way to do a rep - I thought it might be a special kind of rep, like a forced rep, or negative reps, or a special rep tempo - but I've tried all of those types of reps as well. I went back through the last ten years of training journals (yes, I keep a workout journal) and I picked my favorite workout routines and then condensed them and made them better. I used the strength of one program to cancel out the weaknesses of the other. Then, to make sure I hadn't completely lost my mind, I sent it off to my contacts who were PhD's in Biomechanics and Exercise Physiology. They all agreed - It was a radical approach to training, unlike anything they had ever seen and it just might work. At 10 PM on a Monday night I started my first Anabolic Again workout. By 10:45 that night, I was done. Within the first three days I had made considerable strength improvements. In three days I had accomplished what usually takes at LEAST a month. And I continued to break personal records EVERY SINGLE WEEK. Within 12 weeks I was bigger and stronger than I had been in years. I was FINALLY growing again! In twelve weeks I gained almost 6 pounds of muscle mass. To a hard gainer like me suffering from anabolic slowdown, this was nothing short of remarkable. I didn't change my diet, or start some fancy new supplement; all I did was completely RE-ARRANGE the way I trained. I knew I was onto something BIG, something radically different. Keep in mind; I was at my strongest back when I was in my mid-twenties. In case you're wondering, that was more than a decade ago. Back then I used to work in the supplement industry managing a Research and Development department of a major supplement company. I had access to EVERY SINGLE supplement AND supplement ingredient that I wanted. I took more supplements in a day then most people did in a week. Think I'm joking? Before I even THOUGHT of breakfast, I had already consumed 100 grams of protein from my two morning shakes! I was SERIOUS about building muscle. I could mix supplements, double dose, pretty much do whatever I wanted...like I said, unlimited supply (Plus, I didn't have two kids and a mortgage. I could train whenever I wanted for as long as I wanted). And I'm now bigger and stronger then I was back then! So here's the deal - If you are not growing right now, even though you are spending hours in the gym every week, it's not your fault. Even people taking massive amounts of steroids eventually stop growing. 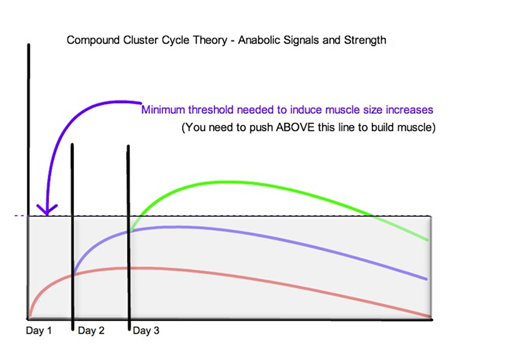 It is actually really impressive if you have reached this point - Beginners and recreational off-again on-again trainers RARELY get Anabolic Slow Down. There is not a workout program in existence that's designed specifically to help overcome anabolic slow down. Everybody LOVES to talk about why you can't lose any more fat, but NOBODY wants to talk about why you can't gain more muscle. This is because building muscle is HARD… almost ANYONE can build 5 or 10 pounds of solid muscle when they first start working out, and that’s why everyone builds programs for beginners. But a workout program designed for experienced lifters? Forget about it. The Anabolic Again Muscle Building Protocol is the EXACT program I used to overcome Anabolic Slow Down, and I'm about to share it with you. As I said before, this program is for experienced lifters or HARD GAINERS who are STUCK. If you easily gain muscle, then this is not for you. If you are the type of person who needs to change and tweak a workout program to "make it work better"
HOWEVER, if you are the type of person willing to dedicate 12 weeks of your life to the most unconventional, controversial anabolic muscle building protocol ever invented, and you are willing to give 100% effort, and understand how amazing it would be gain even 1 more ounce of muscle and FINALLY start growing again THEN THIS IS THE WORKOUT PROTOCOL FOR YOU! Let me be clear here: If you have stopped growing, but aren’t ready to give up then this is the program for you… NOT some 47 dollar on-line workout program designed for the first timer… NOT the program made ridiculously easy because they don’t want people to work hard… Not the program promising amazing muscle growth in one two 20-minute long workouts per week…THIS program – A 137 dollar HARD program designed to help HARDGAINERS grow again. Why 137 dollars? Because it’s worth it. 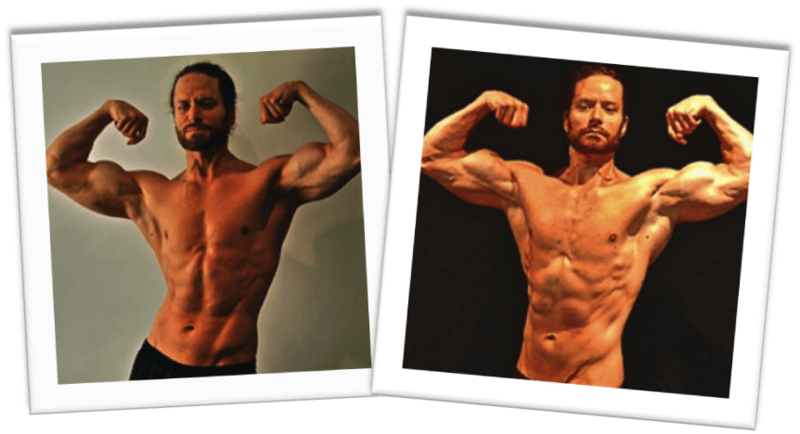 The only trainers I respect charge over 500 dollars a month for on-line personal training – and the Anabolic Again Muscle Building Protocol is better. This is your opportunity to take the bull by the horns and finally start growing again. Look, I know 137 dollars is expensive, and I know you can find 47 dollar workout programs… but you know what 47 dollar workout programs give you? 47 dollar muscle. Besides, everyone knows there is NO SUCH THING as a 47 dollar workout program… that’s just what you pay for the first manual, then after you pay for the first manual you find out that the workout videos, nutrition guide and quick start program all cost extra… usually adding up to way more than 200 dollars. With the Anabolic Again Muscle Building Protocol there is ONE program. It’s all in your purchase – no tricks, no hidden fees and no sneaky upsells. 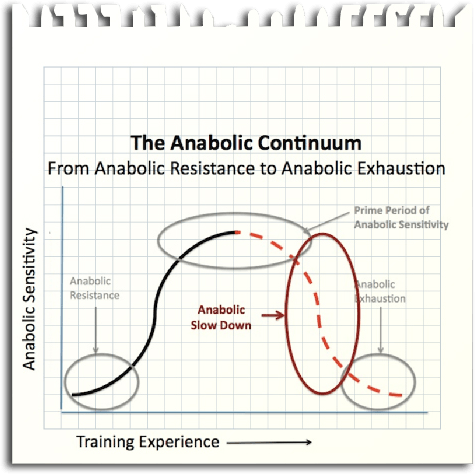 The Complete explanation covering why Anabolic Slow Down is hurting your muscle growth potential - Information you will not find ANYWHERE else. It is also a detailed explanation on how the Anabolic Again Protocol will help you overcome Anabolic Slow Down and finally start growing again. 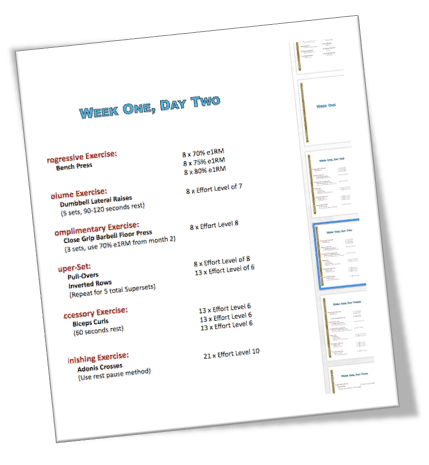 The 12 week workout module outlining each Anabolic Again workout in exact detail. Every set, rep and weight you need to use to make The Anabolic Again Protocol a complete muscle building success is listed here. 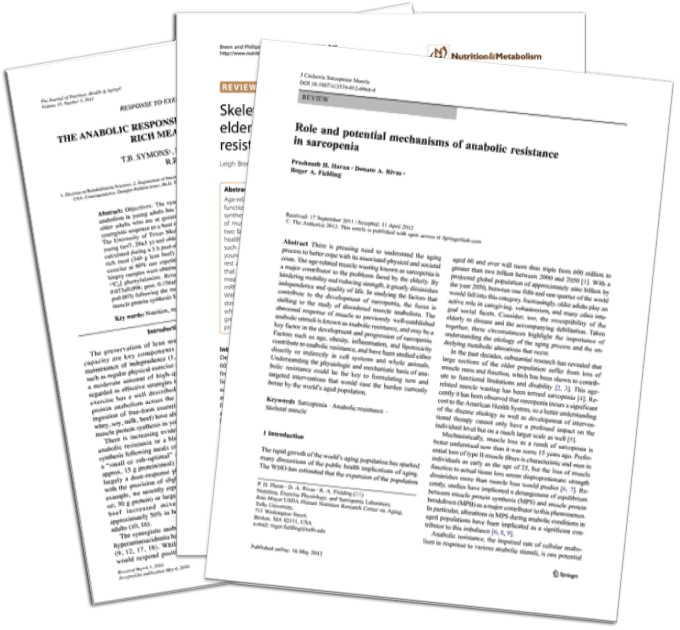 There is no room for guess work in the Anabolic Again Muscle Building Protocol. The illustrated exercise index - Every single exercise that I have used designing the Anabolic Again Muscle Building Protocol. 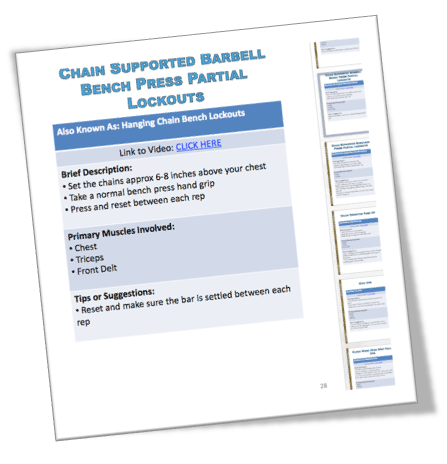 From Adonis Crosses to Chain Weight Pushups and French Press Lockouts, they are all in here. Perfect for the experienced lifter looking for new exercises to add to their muscle building arsenal. 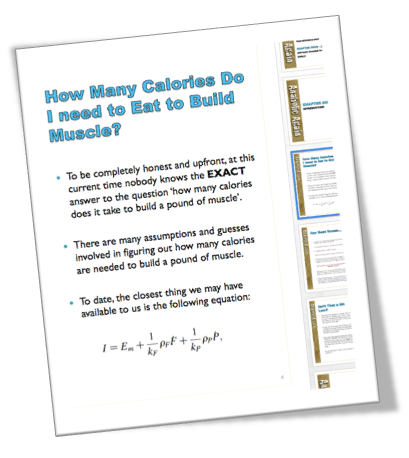 Anabolic Again Nutrition - Do you want the final answer to how much you need to eat to build muscle? This program is designed to build muscle, not make you fat. The Anabolic Again muscle building calculator - The bottom line is that weight is a horrible way to measure muscle growth. Circumferences and girths are better, but they still do not give you a truly accurate description of Muscle Building. Enter the Muscle Index. 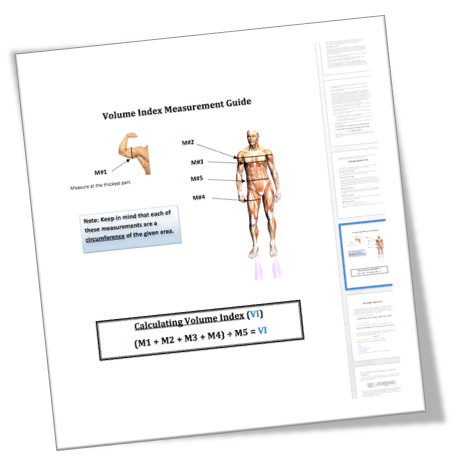 A 2 step, 15 component system to identify TRUE changes in your Muscle Mass. Consider this - I've been trying for over 6 years and this is the ONLY thing that ever worked for me. Not high protein, not High Volume training, not super high calories, not High Intensity Training, not Creatine, Beta-Alanine... NOTHING. You can try, but why bother when I'm giving you the EXACT routine that worked for me? And before I forget, YES – I’m charging you a 137 dollars for a workout because I am SURE it’s worth it, but… If it doesn't work JUST like I'm telling you it will, then it costs you NOTHING. This is what worked for me and my test subjects. But if for some reason you don't, no worries. I have a 100% money back guarantee. Like I said, I'm putting my professional reputation on the line. I wrote one of the most famous on-line diet books ever written, I am not about to sacrifice that reputation to sell a workout program that only 'kind of' works. If at any point over the course of the next 60 days you are not satisfied with your investment in Anabolic Again, just let me know and I'll refund your money - all of it. Most likely you are NOT at your genetic limit. 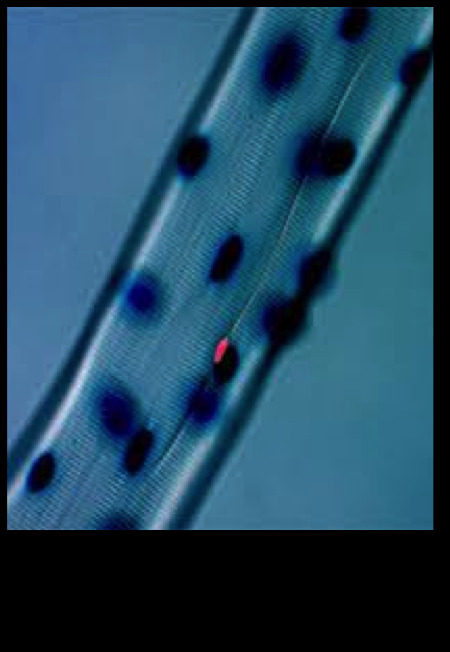 - There is still some dormant muscle growth that can be turned on. And this is the best part – Once you build new growth potential with the Anabolic Again muscle building protocol, that growth potential is PERMANENT! That’s why I’m charging 137 dollars for a HARD workout program that can overcome Anabolic Slow Down and provide you with new PERMANENT muscle building Potential. 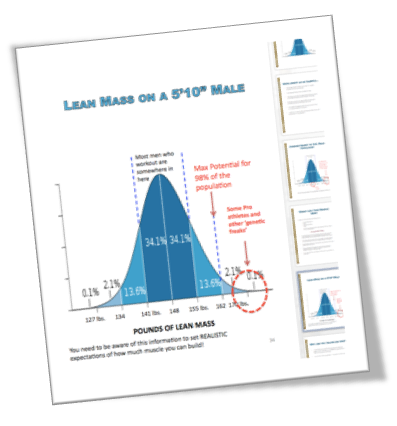 I’m not giving any discounts, I’m not going to pretend that the price is going up after the first 1,000 copies are sold, and I’m not going waiver in my belief that this is one of the best muscle building programs ever developed. It’s not easy, simple, short, sneaky or any of that. It’s effective and that’s what you are paying for, so if you want to build muscle, and your willing to try something extremely unique, then click the add to cart button bellow. You’ll get instant access to The Anabolic Again Muscle Building Workout Protocol. FACT: Muscle is healthy. HOWEVER: Your body will fight the muscle building process after you reach a certain point... to the point to where your typical workouts will no longer build muscle. FACT: You have been lied to if you think you can keep building muscle forever. Your body WILL fight against building more muscle. FACT:You CAN build more muscle, and most likely you have not reached your genetic limit. 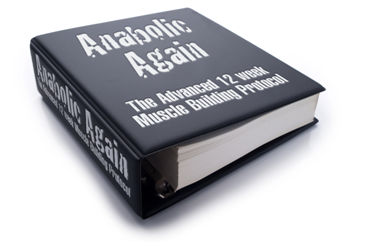 The Anabolic Again Muscle Building Protocol is designed to help even the most advanced lifter build more muscle. And trust me when I say you CANNOT find this muscle building System anywhere else. NOTE: The Anabolic Again MuscleBuilding Protocol is a downloadable product. No physical products will be shipped. After you order, you will get INSTANT ACCESS to download the entire manual directly onto your computer. The manual is adobe acrobat PDF, which can be viewed on Mac or PC. If you have any questions regarding this product please contact support at help [at] eatstopeat.com. Muscle Building Disclaimer: The Anabolic Again Muscle Building Protocol does NOT have a muscle building guarantee. Any product that does is scamming you. Any effective muscle building program requires you to train hard consistently. The Anabolic Again Muscle Building Protocol is my BEST solution for muscle building and outlines all of the principles and scince you need to be aware of to be very successful at building muscle, but it is up to YOU to actually put these principles into action.